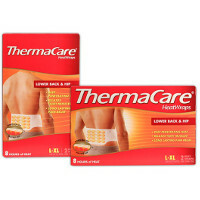 Soothe your back and hips with ThermaCare Lower Back & Hip HeatWraps. ThermaCare HeatWraps keep on working even after you take them off for up to 16 hours of back pain relief. That’s 8 hours of heat while you wear it, plus 8 hours of relief after you take if off.